LEGO fans, kids and adults … a feast of LEGO activities, including workshops hosted by a LEGO Certified Professional, displays of LEGO sets created by LEGO fans, mascot appearances and interactive games. 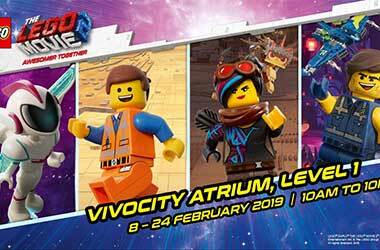 Immerse yourself in multiple LEGO Movie 2 universes including DUPLO Planet, Systar System, Land of Apocalypseburg and the Alien Jungle. Fans of LEGO Movie 2 get to film their own movie with the LEGO Movie Maker. Plan the scenes with the LEGO Movie 2 characters, choose the Apocalypseburg or Systar System background, prepare actions props (like Emmet’s Escape Buggy and Rex’s Rexplorer), place a smartphone on the camera stand and create your own version of The LEGO Movie 2. Mascot appearances by Emmet and Lucy on 9th and 10th February, and on 16th and 17th February. Launch of the grand LEGO Movie 2 set 70840, Welcome to Apocalypseburg. Recreate scenes from the LEGO movie, prepare for the alien invasion. This 3,000 piece set features detailed representations of the movie’s iconic scenes and includes 12 mini figures from The LEGO Movie 2. Available for purchase from 9th Feb 2019. Exclusive gift with every purchase of the 70840 Welcome to Apocalyseburg! Set (while stocks last) – the Emmet’s Lenticular Mosaic, is specially created by LEGO Certified Professional, Nicholas Foo, for The LEGO Movie 2.